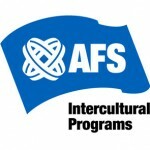 AFS is one of the oldest and largest international exchange organisations in the world providing intercultural learning experiences that bring global cultures together by helping people connect, transforming the lives of thousands of students, families, and individuals every year. Established in 1914 as the American Field Service, this organisation was originally a corps of civilian volunteers who drove ambulances on the battlefields of the First and Second World Wars. Since 1947, AFS has worked to further the cause of international understanding and peace by promoting intercultural exchange programs for secondary school students and teachers, and volunteerism. It is now one of the oldest and largest international exchange organisations in the world, working through a network of AFS organizations in 52 countries and programme activity in another 30 countries. AFS provides intercultural learning experiences that bring global cultures together by helping people connect, transforming the lives of thousands of students, families, and individuals every year. With exchange programs in more than 50 countries and a large network of volunteers, educators, and staff, AFS is committed to helping participants understand their immersion experiences in a foreign culture. China Association for International Educational Exchange (CAIEE). Over the last 20 years, more than 1,200 Chinese high school teachers, from eleven provinces, have been placed in schools in a wide range of foreign countries, where they spend a year teaching alongside their international counterparts. In 1997, an exchange programme for Chinese high school students was launched. In 2004 AFS expects to select 150 Chinese students to go abroad. They receive intensive language training in the country where they are placed, and spend a year living with local families and attending local schools. Starting in 1998, China also now hosts AFS students from other countries. Currently, around 30 students are studying in China under the programme, but numbers were low this year owing to SARS, but are expected to increase significantly in future. The families of participating students usually contribute to the costs of international placements but, especially in the case of students from developing countries, AFS often provides scholarship support. The Year Program, far and away AFS's most popular option, is a year-long educational exploration of another country's culture. The AFS Year Program student lives with a host family, attends a local school and becomes involved in community activities. Students completely immerse themselves in another culture by nurturing relationships with the local community, speaking the local language and taking part in their daily routines. Host school attendance is required, not optional, for Year Program participants. The Semester Program lasts about six months over the course of an academic school semester. Like the Year Program, students stay with host families, attend local schools and take part in community activities. Host school attendance is required, not optional, for Semester Program participants. The Intensive Program is a shorter-length option involving exchanges lasting from one to three months, usually during a break in the student's academic year. The Intensive Program student may select from a number of options, including a traditional homestay, a concentrated language program, an outdoor education program or a cultural studies program.